Who doesn’t love eating from a bowl? It fits in our hands so easily and allows us to dig deep into the delights inside. Plus, you can pack a lot into a bowl – especially if it’s a lovely, deep one. 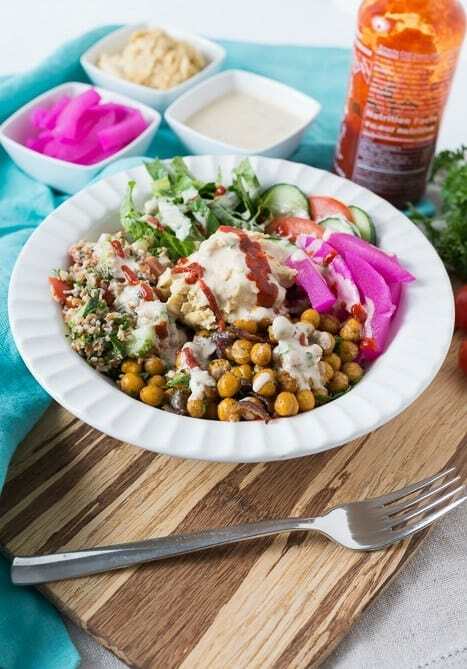 Bowl based meals have become super popular these days because a) they’re full of variety, meaning no boredom; b) they’re fairly easy to throw together and c) they’re packed with nutrition, thanks to the diversity of their ingredients. Most people probably think of a steaming bowl of ramen noodles as being the ultimate ‘bowl food,’ and admittedly, the roots of this way of eating definitely start in Asia. Koreans, for example, love their Bibimbap (bowls packed with meat, rice and veggies), and the Japanese adore their rice-veg-chicken-egg Donburi bowls (considered the ultimate in Japanese comfort food). 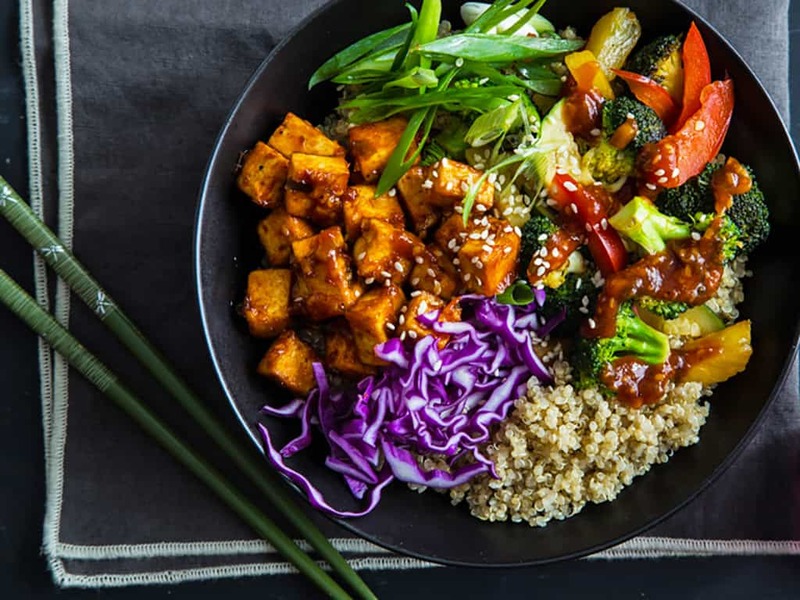 But Asian bowls have been adapted by vegans to include all the ingredients WE love – sure, the rice and veggies can stay the same, but we go heavier on the latter, and add some vegan protein, like nuts, tofu or beans. 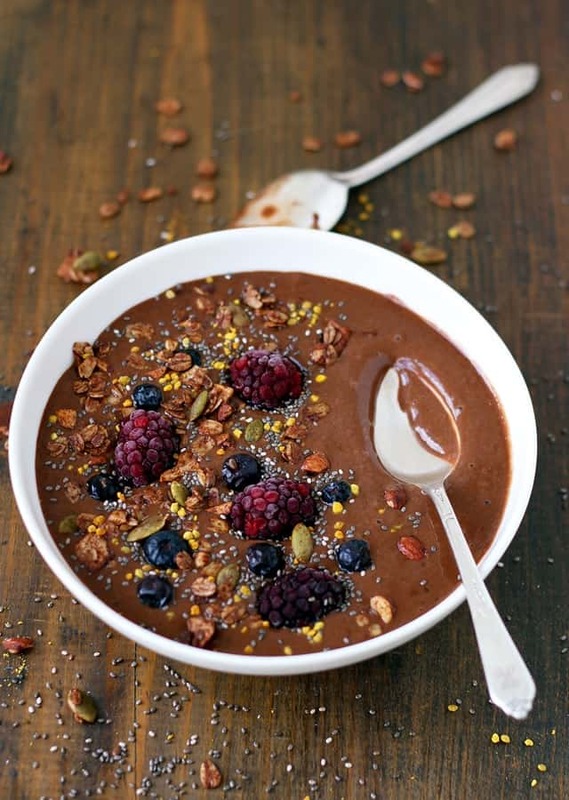 There’s also a trend these days for smoothie bowls – eating your smoothie instead of sipping it, and embellishing it with some crunchy and sweet treats on top – so I’ve included a few of those here, too. So, tah dah! 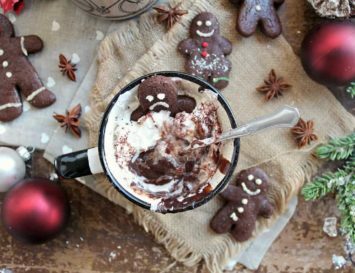 I’ve scoured the web to dig up 30+ of the most awesome, tasty vegan bowl ideas I could find for breakfast all the way through to dessert. Yes, chocolate for breakfast. And why not? This recipe is completely healthy and although it’s pretty sweet, none of that’s due to nasty refined sugar. This is just pure, plant-based goodness. Amen to that. This recipe is really filling! It’s super creamy thanks to all the banana, almond butter, avocado and coconut yogurt, and it’s sweetened from gooey medjool dates and then finished off with a boost of chocolate thanks to the cacao. For me there’s nothing more fuelling in the morning than porridge – so this recipe is the bomb! The creamy porridge is topped with fresh citrus fruits and roasted pistachio nuts, then drizzled with a yummy, sweet tahini dressing. If you don’t eat honey you could substitute this for maple syrup. This tropically infused smoothie is super hydrating, with a load of nutrients and minerals. Almond milk is used as the base; bananas add a creaminess and the blend of mango and kiwi fruit give it that taste of the tropics. Chia seeds add an antioxidant boost and you can top it with nuts, desiccated coconut and seeds to make it all pretty. If you want the comfort of a bowl of oats without standing over a hot stove, then this is the recipe for you. This dish has the warming spices of an apple pie without a single grain of flour in sight. The mixture in apples and medjool dates with some chia seeds thrown in for texture. Top with lots of crunchy walnuts, juicy raisins and hemp seeds for an extra nutritional boost. I love making tofu scramble and putting it into a bowl so that it can be mixed with a whole bunch of other ingredients. And you can pretty much use whatever’s in season or what’s already in your fridge. 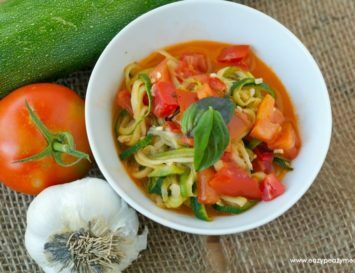 I often have leftover veggies, so recipes like this are a great way to waste less food and use them all up! Oatmeal isn’t just for the sweeter dishes in life – this recipe uses it in a savory way. The oatmeal makes the base and kale, black beans and tempeh bacon go on top. This bowl is an absolute powerhouse of plant proteins. This avocado quinoa harvest bowl is going to revolutionise the way you eat your veggies. There’s a quinoa base topped with sauteed brussels sprouts, but if you’re not a fan of those veggies, know this: when you boil them they tend to go mushy, whereas when they’re cooked or baked they become crispy and way more delicious. Throw on some pumpkin seeds and arugula and drizzle with tahini and you’re good to go. Quinoa makes a really great base for bowls as it’s a high protein grain whose nutty taste goes with just about anything. Kale is mixed with lots of asparagus, scallions, sliced almonds and dried cranberries for an infusion of both texture and flavour. The dressing takes this salad to the next level! Mix olive oil, balsamic reduction and a squeeze of orange juice and you’ve got a simple dressing that’s packed with flavour. Love falafels? Why not break ’em down into a salad bowl? The chickpeas are coated with the falafel seasonings and then baked until nice and crispy. Then you can start to build your bowl with fresh lettuce and pickled turnip (you could use onions or radishes if you prefer) mixed juicy tomatoes. Choose your favourite grain to make a tabouleh and then add a dollop of houmous. 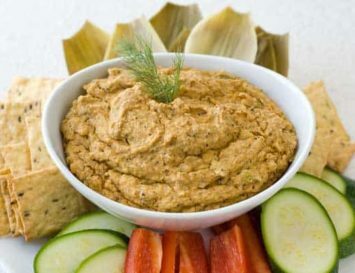 You could add a little tahini and hot sauce for a easy dressing or just opt for some fresh lemon. If you’re looking for new and wonderful ways to use tofu then you need to make this bowl, like, right now. The fresh lemongrass adds a unique freshness to the dish and you can pretty much throw anything into the stir-fry, from broccoli and carrot ribbons to edamame beans and cabbage. 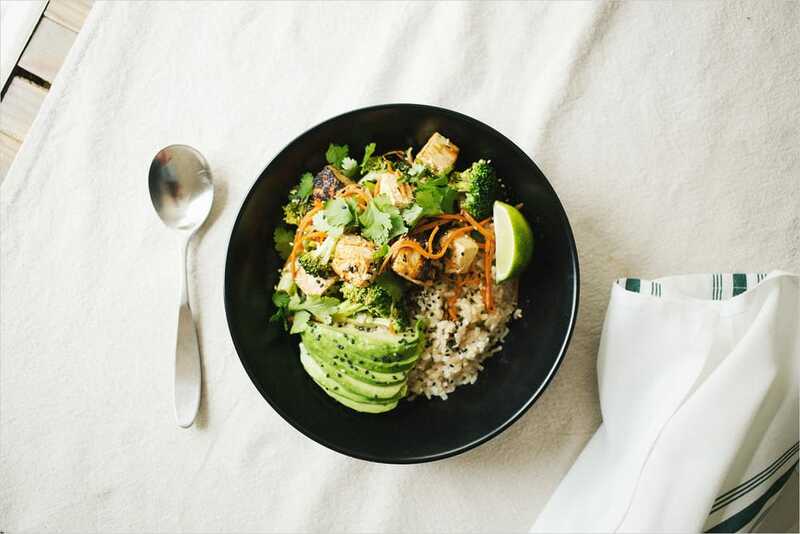 Top the dish off with tofu and avocado and you’re for an Asian inspired dish that htastes out of this world. Cauliflower rice is a great option if you’re looking for a low-carb option that won’t leave you feeling weighed down and sluggish. 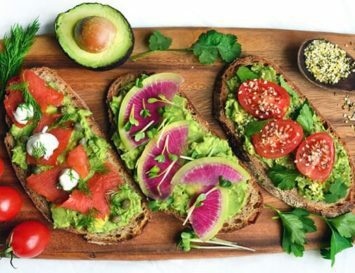 Top with veggies of your choice – I’d opt for cucumber, fresh peppers, chunks of avocado and some pickled onions. And let’s not forget the nori – crush it up and sprinkle over the top as a garnish. I love my taco Tuesdays! But the part I hate it when I make the perfect taco, lift it up to take a bite and . . . it all falls out and goes everywhere. So these little taco bowls are such a great way to enjoy your taco without the mess. Black beans and sweet potato make up the filling with some fresh tomatoes and guacamole. I’d go so far as to add a dollop of vegan sour cream. #tacotuesdayheaven. 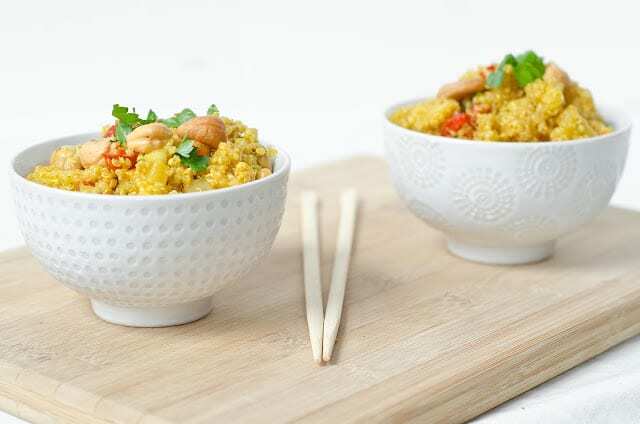 This delicious quinoa recipe has a mild spice from the curry with crunchy cashews and fresh pineapple. You could even cook the quinoa in advance to save time. Not fan of pineapple? Then feel free to switch it out for raisins, but do try the pineapple – it adds a delightful sweetness to the dish which works well against the curry spices. Super simple! It’s just a bunch of fresh veggies and grains with some hummus and avocado, so no real need for a dressing – but if you do love yourself a saucy bowl, we’d recommend a nutty Lemon-Tahini dressing for this one! If you think you have to head down to Chipotle to get a dish that’s bursting with Mexican flavour, think again! 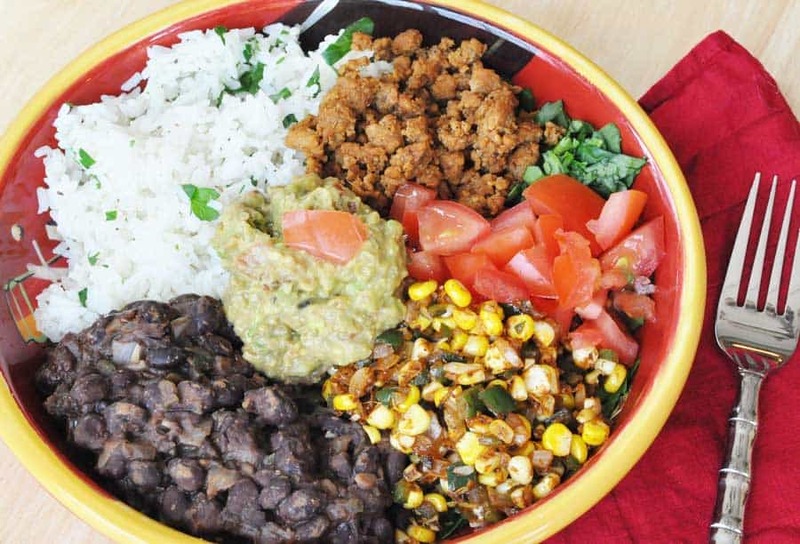 It’s all here: corn, beans, guac, rice, cilantro, tomato…you name it! Create this bowl, put on some Chavela Vargas, and pretend you’re in the land of sunshine and tequila! If you think quinoa’s a little on the bland side, then you need to try this recipe! It gives the grain a yummy depth – shallots, coriander and coconut milk make it all full of flavour and so, so creamy, and there’s a nice little kick from the chilli. The beet tahini gives a vibrancy that makes the dish pop! Perfect for an insta snap! Whether you miss the texture of sushi or are just looking for new ways to use watermelon, this recipe is perfect. The watermelon tuna is baked and then marinated in rice vinegar to recreate a similar appearance and texture to tuna, and works to reduce the sweetness of the fruit. It’s then mixed with crunch pickles, chunks of avocado, crisp scallions, some seaweed for an added saltiness and some fluffy rice. This dish is a real treat for those taste buds. Flavoursome grilled tofu sits on a bed of grilled bok choy, sweet and salty candied cashew nuts, crispy green onion and lots of fluffy rice. The Pulo’s Pineapple Tamarind marinade in the star of the show; drizzle it over the top so you get some with every bite of this delicious bowl. Cauliflower is steadily getting better press thanks to the vegan community revolutionizing the way in which we view this veggie. Once upon a time, a bland and at times mushy side dish, it’s now the star of the show and can be used to recreate all kinds of foods from buffalo wings to tacos. And this recipe captures their wonderful versatility with their crisp coating and the zesty cilantro and lime rice; delicious! This bowl looks so damn healthy, it probably cures death. Garlic broccoli, roasted soy chick peas, chili lime kale and curried sweet potatoes mean this dish is also just packed with a variety of delicious flavours. I live for firstly, dishes full of sauce, and secondly the sweet and spicy combination. They’re just the way to my heart. So I’m diggin’ this Korean inspired bowl. The tofu is sweet and spicy and is super quick and easy to make. All you need to do then is dress some soba noodles and pan-fry the tofo cubes and serve with some pineapple and spicy kimchi and you’ve got yourself a real infusion of flavour. 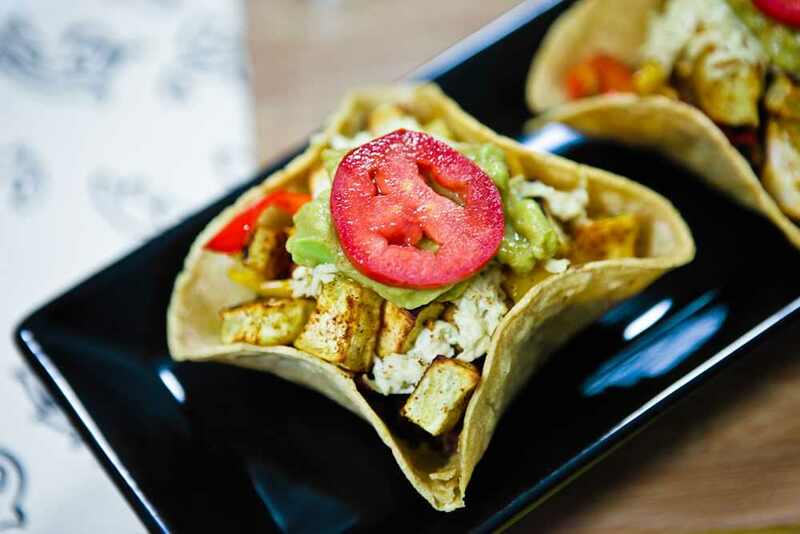 Smack your tastebuds to life with this vegan nacho bowl recipe. It’s bursting with veggies, is packed full of vitamins, and has a base of complex carbs to sustain you and keep you fuller for longer. The best part? That tangy salsa that’s all over the place…yum! The colours of this dish are just gorgeous! But the best part of this recipe is how quick and easy it is to put together. It’s full of lots of fresh vegetables and crispy, fried tofu served over a bed of sweet coconut rice. 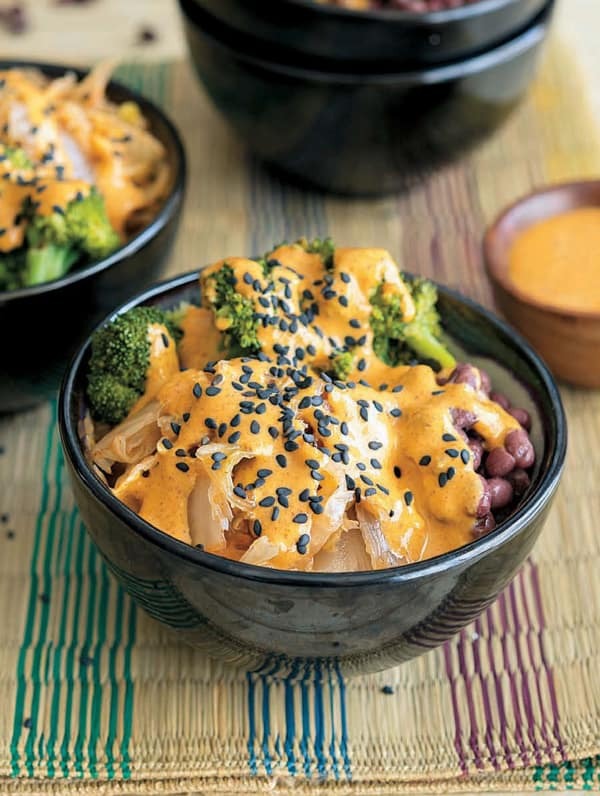 A simple and yet tasty Thai peanut sauce is drizzled over the top and really brings it altogether. Create this beauty in just 15 minutes! Forbidden rice may at one stage have been reserved for Chinese emperors, but we’re all going to feel like royalty after tucking into this soulfully good Buddha bowl. It’s all mixed up with purple cabbage, dino kale and a mixture of cilantro, green onions and lime wedges – then it’s dressed with a coconut, almond and lime sauce and served alongside some sesame carrots. Prepare to feast! Are you sometimes like, ugh! Enough with the veggies already? I need something filling!? Well, this bowl is for you. Here, there are some veggies of course, but the focus is on millet, filling heritage potatoes and lentils, all topped off with a smoky tahini sauce. This fishy vegan bowl is pretty intriguing. The ‘fishy’ component itself is heart of palms that are mixed with dulse seaweed flakes which gives it that distinct fishy/salty flavour. This is then mixed with a crunchy slaw and pico de gallo which is basically a really fresh tasting salsa made using fresh tomatoes, onions, cilantro and a little spice from jalapeños and then tossed with lime juice. 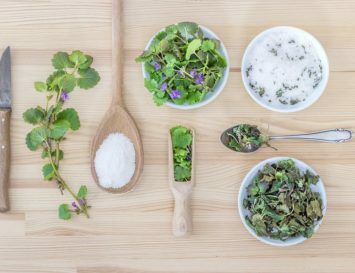 This is a really fresh-tasting recipe that may surprise some of you. This bowl inhibits the Ayurvedic philosophies of warming or gently cooking the food in which you eat, as the beauty is to be mindful of the foods, and bringing balance to the meal. And this warming bowl is made from mung bean and spinach, and the prana promotes wellness and slow releasing energy to power you through the day. How wonderful and decadent does this pudding bowl look?! It’s pretty easy to make, too. Simply combine the ingredients in a blender and make that magic happen. 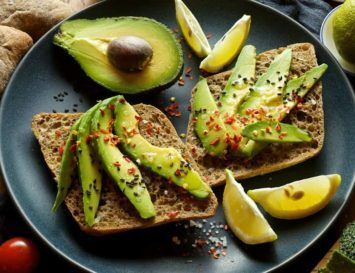 The base is avocados which makes it extremely creamy, whilst its sweetened with maple syrup, vanilla powder and a little almond milk. Top with whipped coconut cream, cherries and cacao nibs and your chocolate dreams are a reality. I used to live on Cadbury’s cream eggs. The chocolate, the cream filling . . . it just worked. So I was so happy to find this vegan version of my much loved childhood sweet treat and turned it into a delicious dessert. The bowl around the ‘egg’ is made of chocolate and filled with white chocolate mousse and then topped with an apricot. A super fun dessert and no chickens were harmed – yay. 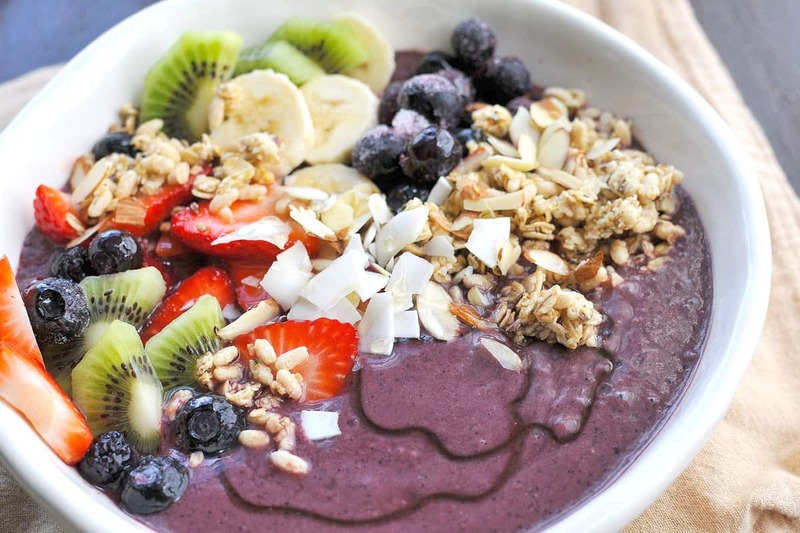 Wow…so veganism is such a thing now that we can actually refer to an Acai bowl as ‘classic’! YESS! This one not only features the Brazilian superfood topped with more fruit (huzzah! ), crunchy granola (huzzah huzzah!) and nuts, seeds, cacao nibs and coconut, but you’re also welcome to add whatever you love, be it pound cake, apple pie filling, cookie dough…whatever! Main image: Korean tofu veggie bowl. Get the recipe here.